"I would like to order a caricature in colour marker with theme - with background & body. 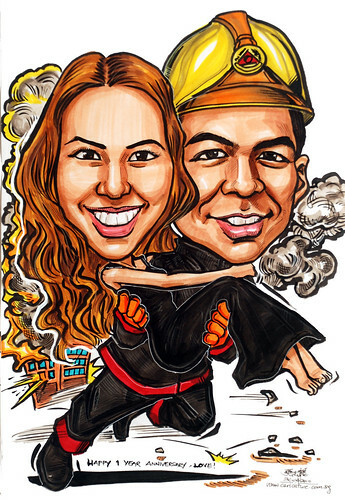 My boyfriend is a firefighter wth SCDF who has just been promoted as a staff sergeant, this caricature will be a token of his promotion and another gift included for his upcoming birthday. Basically what I would want is a caricature of him carrying me as the foreground and a burning building as the background. It will be like the hero saves the princess from the burning building story minus the fairytale. The background will be a building(s) on huge fire, with black smoke engulfing the building(s). The foreground will be him carrying me like he had just pulled me out of the fire and my arms would be around him and my expression looking completely awed. He will be in a SCDF uniform and I will be in an off-shoulder black long gown with a bare feet. The rest I will leave for your professional hands to make it look great. Let me know and I will provide you with all the photos, information, details you might require to make it as easy for you and as life-like for me as possible"
No awed expression, as the client can't provide me with such photo of her. This expression looks good enough to me. Added in more smoke and fire, upon her request. "Hey Jit, I liked it and now I really love it. Thanks!"